I have a few minutes for a quick update, and a few of you have asked me when my next blog post will come! The thing is, while there’s been lots of progress here at No. 77, the pictures simply won’t do justice to the amount of work we’ve accomplished! Jordan and Jim have done SO much electrical work! They’ve run new wires for outlets for our kitchen peninsula, they’ve fixed a broken breaker and added a new one. They’ve boxed in the new pipe that they moved from the middle of our kitchen into the wall. Jordan’s also made some progress on our kitchen floor. We were going to install a new ‘underlayer’ on top of our existing subfloor when we noticed a few cracked and creaking boards. We didn’t want to install tile and then heavy cabinets and appliances on top of that, so we had to replace those boards. Well, three trips to the lumber yard and six hours later, we’d only managed between the two of us to get TWO boards replaced and none of the underlayer installed. However, in doing this work on the floor we had to pull back the carpet from the dining room, and the hardwood underneath seems to be in really good shape! I’m looking forward to refinishing those floors. Mostly because it will mean the END is in sight! Or rather, that our most pressing goal of moving in by the end of the month will be in sight! I’ve gotten a few smaller things done around here. My friend Charlotte and I planted the pots on our front deck! 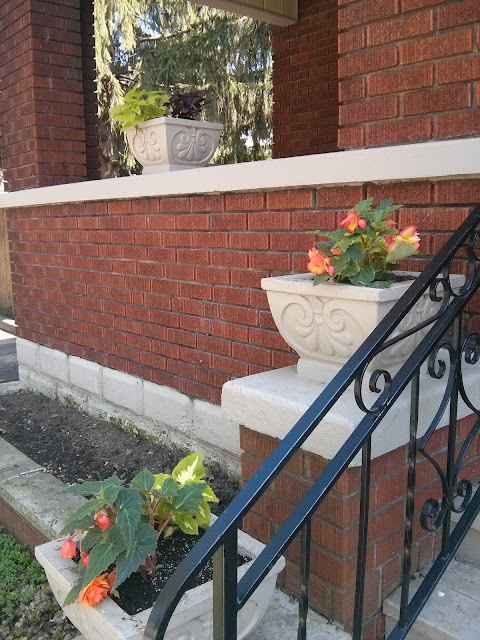 We planted a lot of orange-y pink begonias, some lime green coleus and potato vines, as well as some bight pink and purple coleus. 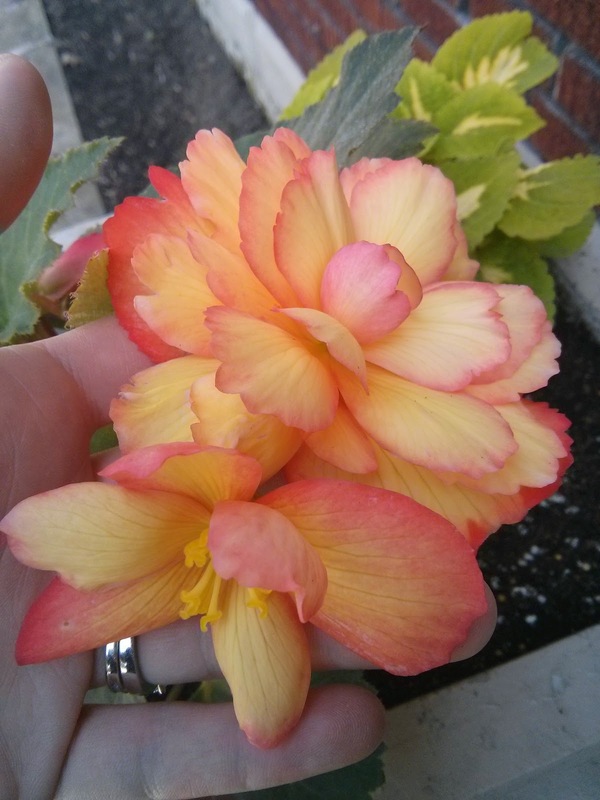 Our friend Marie also gave me a couple pots of begonias for my birthday! They match perfectly. This morning I picked up some veggies for the backyard as well as some New Guinea impatiens for the long raised beds at the front of the porch. This week I’ve also continued my work on the walls. Forever these walls! Our contractors paper taped and mudded over the seams between cement board panels, which was a huge task. 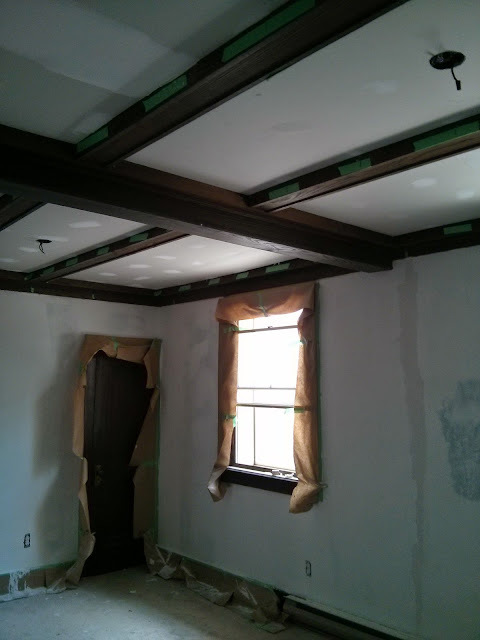 They also installed drywall onto all our main floor ceilings so we don’t have to strip wallpaper and sand THOSE boards. I can’t even imagine. We were hoping to start painting earlier this week, but in true home renovation style, even that had to be postponed a little while. We went to the store, picked out our colours, bought samples, and I hurriedly painted on patches in each of the rooms to see if we liked the colours! 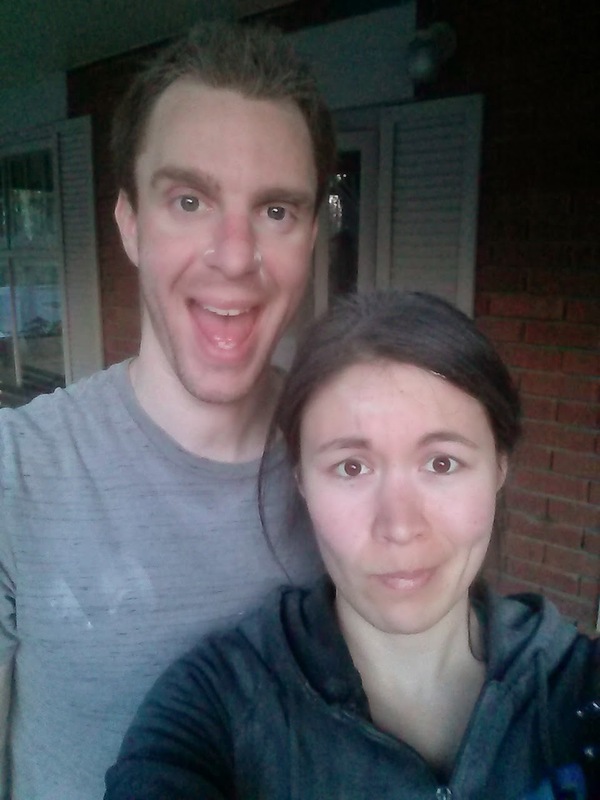 Well, we confirmed that the texture of the cement board still showed through the paint, so….. I taught myself how to skim a wall this week. Basically, you have a huge bucket of drywall mud – heavy, gloopy, thick stuff. You scoop some onto a “hawk” which is a piece of stainless steel with a handle on the bottom. Then you have to put the mud on the wall with some technique. Then, with finesse, you scrape off all but the thinnest little coat of mud, leaving a (*hopefully! *) smooth surface. I did a first layer on each of the walls, patching up the worst gouges and pock-marks in the cement board. Then, comes the SANDING. Guys. I HATE SANDING. Thankfully we aren’t working with the orbital sander anymore, because that kicks up the WORST dust. And, thankfully, drywall dust is nowhere near as smelly, and probably nowhere near as toxic, as the wallpaper dust. But it dries out your hands and it gets everywhere, even though it’s pretty good at falling right to the ground. After this first sanding I’m going over with another very thin layer of mud, and hopefully that will be ready to paint by this weekend. If you have a spare moment to send us encouraging thoughts, please do! There seems like a lot of work still ahead, and I know we’re going to run into inevitable glitches along the way. It would be nice, however, to have at least one of our projects go according to schedule. * pack up the old place and move into the new place! In the meantime, we just do what’s next on the list! Or, we do something that brings us joy, even if it’s not essential to getting moved in. UP NEXT: Painting party on the weekend and hopefully installing the kitchen early next week!